mophie has been the go-to company for battery cases and external battery packs to keep your iPhone or iPad going strong, but with the powerstation USB-C series of battery packs, there’s plenty of power to keep even a MacBook Pro charged up and going well beyond the capacity of the built-in batteries. In this review, we’ll take a look at the mophie powerstation USB-C 3XL ($199.95), the latest and most powerful of mophie’s USB-C battery packs. Beginning with its first mophie battery cases for iPhone, the company has always kept an eye on the looks of its products. That’s the first thing that hits you when you see the powerstation USB-C 3XL — it looks more like a fabric-wrapped book than a battery pack. That gray fabric wrap does more than just make the 3XL look good; it helps you to get a grip on the heavy pack when you’re taking it out of a bag. A solid plastic case would be slick to the touch, and mophie wisely added the neutral fabric. On one chamfered side is a small button and four LED lights. The button is there for checking the current charge level in the 3XL, which is displayed by the four LEDs. At the top of the 3XL is one USB-C port for charging the pack well as one standard USB-A port and another USB-C port for charging accessories. This could come in very handy; it’s easy to charge both a MacBook and an iPhone simultaneously. Two cables are included with the 3XL — one USB-A to USB-C cable and another USB-C to USB-C cable. The former would generally be used for charging the battery pack, while the dual-ended USB-C cable is perfect for charging that MacBook. It’s also going to be useful for charging the new iPad Pro models, which both come with a USB-C port. Capacity wise, the powerstation USB-C 3XL holds a whopping 26,000 mAh of power! mophie says that this is enough to keep a MacBook running for an additional 18 hours, an iPad (7th generation) for another 17 hours, and an iPhone X for another 85 hours. Size-wise, the powerstation USB-C 3XL is 3.7 in x 6.6 in x .91 in (99 mm x 168 mm x 23 mm) and weighs 18 ounces (514g). There’s not much to say about a battery pack; it’s designed to provide extra charging power when you’re away from a power outlet. 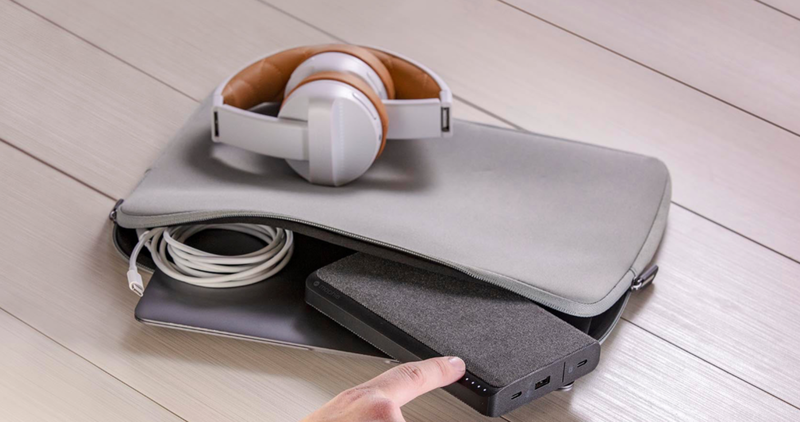 But with the powerstation USB-C 3XL, mophie has really added extra functionality by making it possible to keep a MacBook, MacBook Pro or other USB-C laptop charged up. In fact, if you connect the powerstation 3XL to a MacBook, you’ll find that it charges somewhat faster than usual thanks to the 45W USB-C Power Distribution (PD) technology. This also means that an iPhone can be charged at a much faster rate — up to 2.5 times faster. All you need is a USB-C to Lightning cable, and 18W charging for the iPhone becomes available through the PD port. Pass-through charging of both the USB-C 3XL and another device is made possible with what mophie calls Priority+ Charging. This means that the connected device is charged fully first, after which the battery pack is topped off. While charging is taking place, you must press the side button to see how it’s going — the flashing LEDs shut off after a short amount of time. For charging a MacBook Pro, for example, one could connect the powerstation 3XL directly to the Apple power adapter, then run a USB-C cable from the powerstation 3XL to the MacBook Pro. Both devices will get charged — the MacBook Pro first — and you’ll have a fully charged 3XL to give you hours of extra work time. This isn’t a lightweight little battery pack to give your iPhone a boost; it’s a power pack that will keep even a laptop going for hours after its internal battery has gone dead. At a price of $200 it’s not cheap, but if you’re a road warrior with a USB-C MacBook who wants to keep things going even when there are no power outlets around, the mophie powerstation USB-C 3XL is definitely the power pack you want to buy.